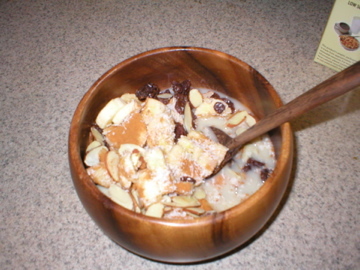 This home made granola cereal is a favorite raw food breakfast of mine when I want something hearty and substantial. The coconut absorbs the almond milk and the contrast of the soft fruit and crunchy nuts makes for a satisfying meal, especially in winter. Quick and easy! As with most raw foods, this can be eaten at any time of the day and the ingredient amounts are all to taste — no need to measure anything. Some folks don't like or recommend combining fruit and nuts as they digest at different rates, but find what works best for your system. For a lighter meal, add more fresh fruit and less dried fruit and nuts. Add strawberries or raspberries in for extra color and lightness. If you want to go even lighter, simply eat a bowl of fruit and skip all the nuts and milk. Add a little agave nectar to sweeten if absolutely necessary, but usually it is sweet enough on its own, especially once you add in dried fruit which tends to be very intense in flavor. If you have leftover coconut with bits of nuts in it from the Coconut Balls recipe, it's excellent to add to this home made granola (for a raw food breakfast, or anytime). You can even take a coconut ball or use some of the batter to crumble into this for more crunch and sweetness. Have fun creating your own favorite versions and enjoy! P.S. This recipe was inspired from a famous raw food chef, Ani Phyo. For more of her recipes, see her beautiful and amazing recipe books.